The Wall concert presented by Roger Waters might be the biggest blockbuster rock show in history - literally. And not just that. The presentation is a scintillating repudiation of mankind's darkest natures and the behind the scenes powers that be who run the machine. 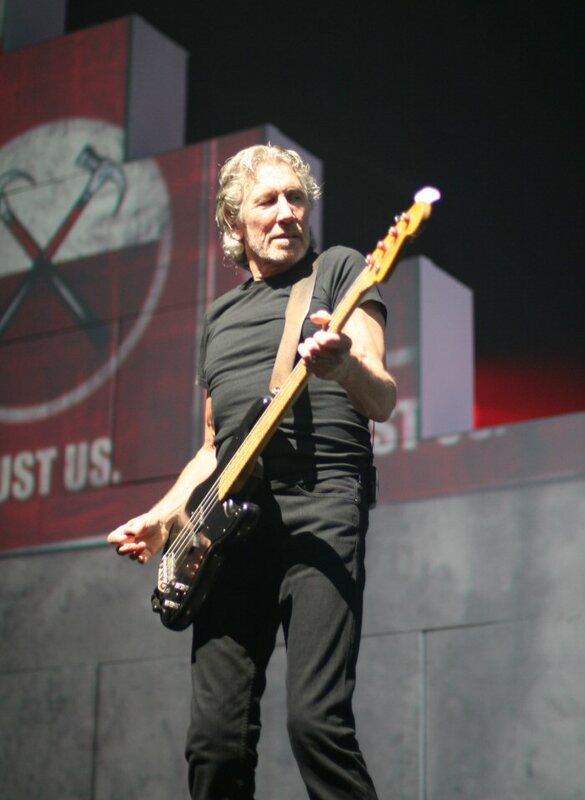 Roger Waters on stage in Albany, New York in June 2012. From corruption, deceit, deception, greed and the horrors of war - it was all there for all to see at the Times Union Center in Albany, New York on June 28, 2012 when the legendary member of Pink Floyd brought his huge solo production to the Empire state's capital city and a near-capacity crowd of over 10,500 adoring fans. The Wall was originally released in November of 1979 and the songs from the double album dominated the airways for much of the 1980's. The Wall was a concept record revealing some of Waters' personal stories through a character named Pink. It was a rock opera about abandonment, breakdowns, relationships and self-imposed isolation. The record also touched upon the ills of mankind's warring ways. The 2012 live version of The Wall was bigger than a tale of personal isolation - it was about suffering on a large scale as a result of conflicts and corruption. 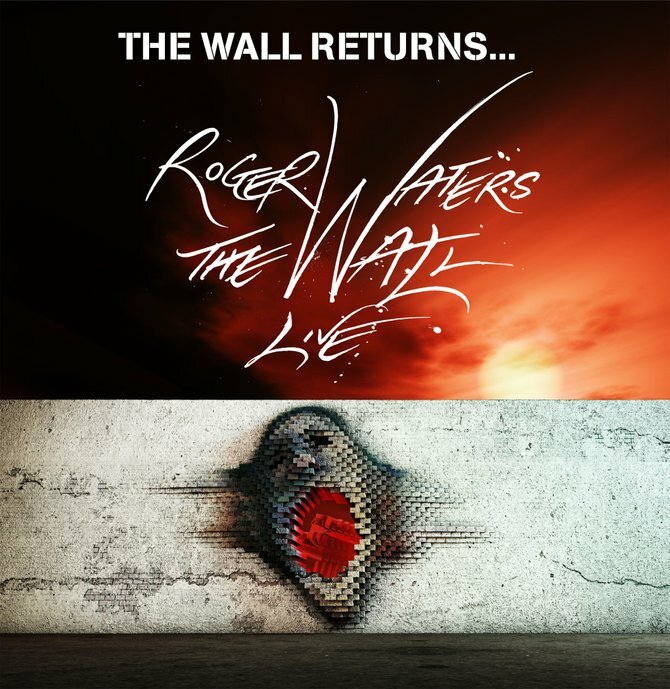 Waters used The Wall in bold fashion to punctuate his points and the result was a serious yet spectacular rock and roll spectacle! Prior to the concert anticipation was high in Albany. The street in front of the Times Union Center was closed for people to congregate. Lots of folks were wearing Pink Floyd and Wall tour shirts. The fan base spanned the generations from kids to folks who have been following Roger from his early days. As I took my seat, the people behind me said they drove up from the DC area for this and have been waiting over 30 years to see The Wall. Before the show, some of the blocks in the wall were already in place. Banks of lights and speakers were all around the stage where there was a large circle - just one of the many components used for the multi-faceted visual displays of The Wall. The presentation was complex combining various forms of media and lighting. The Wall was an amazing spectacle that included countless visual enhancements. Soon after eight p.m. a voice boomed overhead and welcomed us to The Wall. Smoke and search lights filled the arena. Roger appearing fit and clad in black came out looking into the crowd. His first rate band started with the dramatic "In The Flesh" enhanced with pyro and flags waving. A baby's cry was heard and black and white photos with some general information about people who died in wars spanning WW II to present were shown adding to the poignant progression of "The Thin Ice". 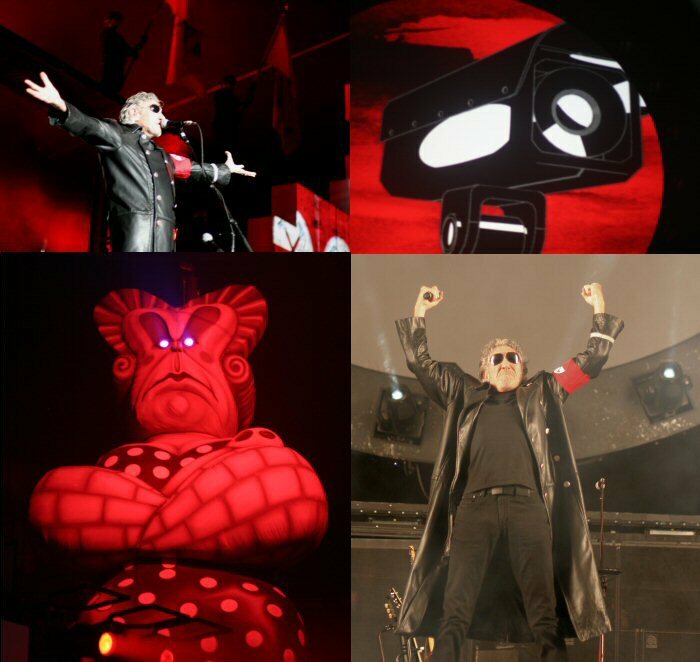 Lots of red lights were used at the start of "Another Brick In The Wall, Part 1". More vibrant visual effects flowed into a dazzlingly display of images, lights and sound. Roger was supported by a sizable talented team giving every song from the album a rich robust tone. I was sitting on the floor and my husband was in the last row of the arena and we both thought the sound was clear and crisp. "Another Brick In The Wall, Part 2" featured a large menacing puppet teacher. More bricks had been put into the wall as a group of youngsters sporting black tee shirts with the words "Fear Builds Walls" sang the infamous "we don't need" parts. Later, Roger thanked the kids and explained that they were locals picked during the sound check to perform that night. Rogers Waters performs "Mother" at the Times Union Center. Another intimidating figure appeared as Roger armed with an acoustic guitar sang and strummed "Mother". Adding to the moment was the use of a film of Waters from the 80's performing the song so he was able to harmonize with his past and present selves. As the questions of the tune unfolded words were reflected on the wall stating that big brother/mother is watching. As the concert progressed more warnings and questions like "should you trust the government" flashed upon the wall. The wall continued to fill in with gaps left for the audience to see the band with the last brick put in place as Roger finished up the first part of The Wall with "Goodbye Cruel World". On the wall was a note thanking people for sending in photos of fallen loved ones and throughout the intermission pictures and short bios of people such as activists and soldiers appeared on the wall. Since rebuilding the wall in 2010, it has become a common practice for Roger to meet and greet veterans during the intermission in conjunction with the Wounded Warriors Project. Waters takes the time to talk with and thank those who have been injured in service to their countries. The second act like the first ran in album order. High points included "Hey You", "Comfortably Numb" and "Run Like Hell". Again the spectrum of sensations and sounds enhanced the overall spectacle of the music and the stories. The concert climaxed with the wall coming down in daunting musical fashion. The performance ended acoustically with "Outside The Wall" where Roger played a horn and thanked Albany for coming to the show. The fully constructed wall as seen from the back of the house in Albany. The actual wall was a major component of the production. It was utilized to visually broadcast ideas and images and served as a large-scale calling card for change. The effective use of lights added to the impact of the music, which is just as powerful today as it was in the 80's - perhaps even more so in light of the current state of the planet. Roger effectively used his epic to make potent points that included anti-war sentiments and warnings about tyranny. 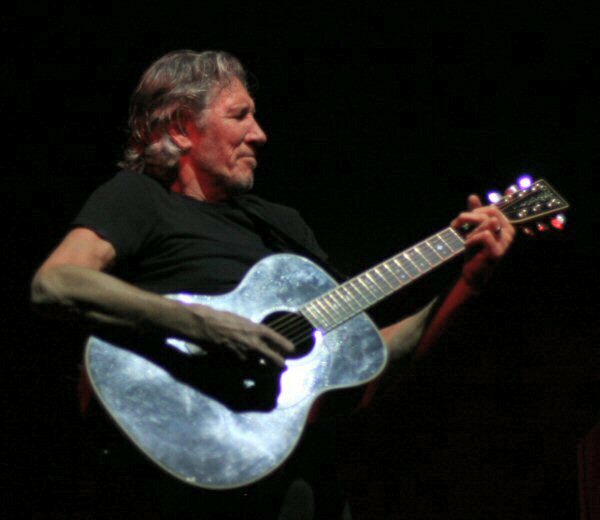 Roger Waters and his band raised the roof in Albany, New York with their stunning show. Musically and theatrically The Wall was entertaining. Yet, it was also engaging touching upon important issues that need to be addressed and left some hope that perhaps we can re-build our own world one brick at a time. 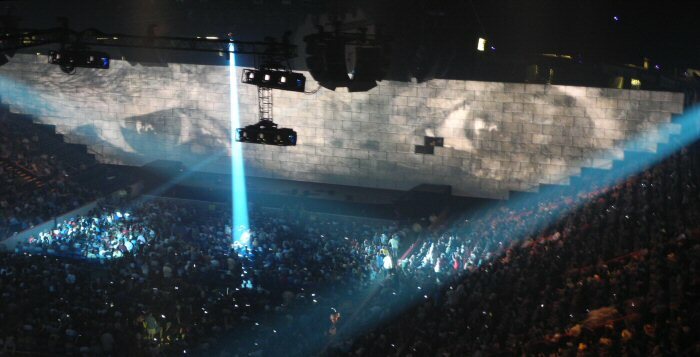 To the delight of Pink Floyd fans worldwide The Wall has returned in 2010, 2011 and 2012.